Inspired by years in the field of Jewish education and a growing community desire for independent programs, Alison founded CJL in 2010. Offering multiple points of entry for students and adults, CJL offers an after school, bar and bat mitzvah studies and ceremonies, and community events. Prior to establishing CJL, Alison served as Director of Education for a synagogue community of 400 families. Responsibilities there included teaching (all ages), program and curricular development, teacher training and community facilitation. Alison's work has been enhanced by studies at the SIT Graduate Institute in the Conflict Transformation Across Cultures (CONTACT) program, courses with Facing History and Ourselves and as a community mediator and trainer with The Mediation and Training Collaborative. 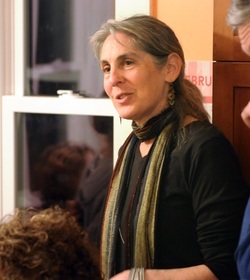 ​Rebecca Busansky is a member of the Northampton School Committee and a CJL founding parent. She and her husband Jonah, moved to the Valley in 2010 with their three children, all of whom participated in the CJL after school and celebrated their bar and bat mitzvahs CJL style, in the last several years. Her family was inspirational in supporting the CJL Torah campaign. Rebecca is the Coordinator of the PVGrows Investment Fund, which provides financing to local farm and food businesses through community investments. Rebecca has worked for the PVGrows Network since 2013 and joined the Franklin County CDC team in 2015 to coordinate the PVGrows Investment Fund. Rebecca earned an undergraduate degree from Brown University and has worked in the community economic development field for over 20 years. Joan Tabachnick is nationally recognized for her expertise in sexual violence prevention and social marketing. Over the past 25 years, she has developed award winning educational materials and innovative programs for a wide variety of national, state and local organizations and asked to participate on national expert panels for a variety of organizations including the Centers for Disease Control and Prevention, the Office of Violence Against Women, and the Unitarian Universalist Association. Joan's favorite quote from her daughter Rosie is, "Do something and mean it!" Jane Fleishman, Ph.D, from Northampton, MA, is a mom, educator and consultant with more than 30 years' experience as a teacher, trainer, and program evaluator. In addition to her work as a sexuality educator/researcher, she is an avid baker and enjoys baking challah with other children and adults. Jane was a co-founder of the Western Massachusetts Chapter of Bend the Arc, a progressive Jewish social justice organization. She believes in working for social justice in all of her work and works to build community in all of her endeavors. Val Miller, CJL's administrator/webmaster and board member has an eclectic background. She has many years of experience in the computer industry, and in the field of educational development. Currently, Val is a Certified Hypnotist with a focus on weight loss, pain management, and anxiety. Val also loves to bake and is happy to provide treats to CJL events and the Amherst Survival Center. Deb Krivoy became the Director of the Pioneer Valley Jewish Film Festival in 2017. Deb is a member of CJL's board of directors, an educator with 25 years of experience in curriculum design, teacher-training, arts program management, and educational materials development. Deb was a Director at Avoda Arts, where she sponsored a five-year traveling exhibition of Jewish ceremonial art, and co-founded the New York Jewish Student Film Festival. Prior to joining Avoda Arts, Deb served as Director of Program Design Services for an educational consulting firm in Boston, where she oversaw the creation of workplace learning programs focused on leadership, teambuilding, mentoring, and critical thinking. Deb holds a Master's of Education from the University of Massachusetts and has written several articles on integrating the arts into Jewish learning. Dave Marlin​ is our CJL Treasurer.